What a great week! This is the life. Lake Cowichan is beautiful and the house boats are perfect. Loads of room. Easier than hauling our trailer. One suggestion... the hot tub should NOT be optional! Get the hot tub! And the early arrival was more than worth the easy boarding and quiet first night. Island Houseboats has been offering families the summer vacation of a lifetime, since 1999. This area is unbelievable breathtaking and truly allows you to “get away” from it all! The lake water is crystal clear and is so clean you can drink it safely! You can search for silhouettes in the cool shadows of the rain forest and meander miles of sedate shoreline or beach in the solitude and watch the setting sun paint the mountains black. 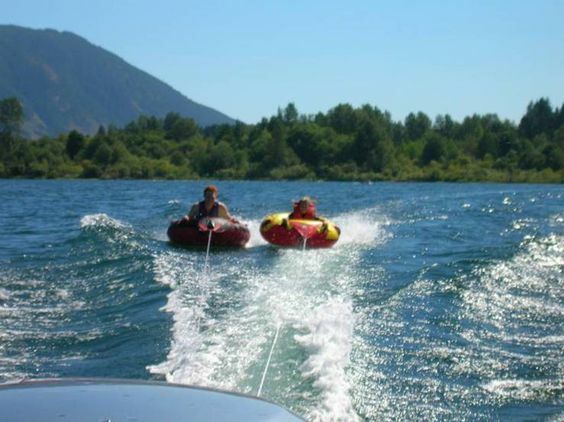 Truly, a vacation that will stay with you for a lifetime, Cowichan Lake, a peaceful place and a place that offers an unforgettable opportunity, a vacation for all age groups in this fast paced world. Our success is due to our incredible and loyal customers who return year after year and tell their friends.We truly thrive on making sure that every guest (including children) leaves here with highlights and memorable moments for a lifetime. We can't wait for you to experience the vacation of a lifetime.